The real question about the Mongols is, “Why did they win, and why did they win so big?” The Mongol empire is the great singularity in human history (though I’m sure that there are others in human prehistory): how did two or three million nomads — a nation without cities or writing — manage to conquer over half of Eurasia in less than a century? Invasions and raids on wealthy states by their poorer neighbors are a historical constant, but nobody asks “Why the Petchenegs?” or “Why the Xianbei?”, or “Why the Sarmatians?”. Genghis Khan’s Mongols are a real puzzle, like nothing that had ever been seen before. It begins with the military advantages of the steppe. The harsh, dry climate of inner Eurasia is agriculturally much less productive than that of the sedentary world, so the interior spaces of the continent are thinly populated, and the population is small even in absolute numbers. (It has been estimated that the Chinese outnumbered the Xiongnu and their allies by at least 30 to 1, but the Xiongnu were a thorn in China’s side for centuries). But the agricultural wealth which the nomads lacked was compensated for by huge numbers of sheep and horses, which made possible enormous cavalry armies which the sedentary world could not come close to matching. Furthermore, pastoralism is not labor-intensive, especially not in the fall when wars are usually fought, and the Mongols could mobilize 10% of their total population on an ongoing basis, and as much as 30% for a brief period. The nomads are sometimes described as having had a pastoral economy, trading livestock and animal products for grain and other supplies, but periods of peaceful, equal trade were relatively short and infrequent. Normally the nomads used their military superiority to ensure that their trade with the sedentary world was carried on under very favorable terms, as though China were the nomads’ colony. Without the military advantage, they would have been in the disadvantageous and exploited position of the the hill people in South China, trading a few specialized products for whatever they could get from the wealthy, powerful Chinese. Mass cavalry armies appeared only toward the beginning of the first millennium B.C., probably in the area north of the Black Sea and Caucasus. Cavalry forces have many advantages against infantry defending fixed lines, the critical ones being being mobility and speed. Defenders must stretch their forces to defend every point on a long line, whereas cavalry can concentrate their forces at the line’s weakest point, and if they break the line anywhere they win. Once inside, the nomads are impossible for the slower forces to chase down, and their normal practice was to carry off as much plunder as they could and then return to their homeland. Warfare was also much more costly for the sedentary world than it was for the nomads, who had no permanent infrastructure to destroy — no houses, no storehouses, no treasuries, no bridges, no mills, no workshops, no city walls, no cities, nothing. The nomad armies would disperse in retreat just as they had concentrated in attack, and pursuers could do little more than pick off a few of them here and there. Furthermore, nomads were self-sufficient on the steppe, whereas supplying the pursuing armies is both expensive and risky, since supply trains are vulnerable to attack. In general, sedentary attempts to control the steppe were money-losers: for rulers, agricultural land is highly profitable (and indeed, the basis of government finance), whereas steppe land never produces as much tax revenue as it costs to control it. Horses can be raised on good land as well or better than they can on arid land, but stock-raising is extensive, and too much tax revenue is lost if large acreages of agricultural land are converted to grazing. Buying horses from the nomads is possible and was routinely done, giving the peoples who neighbor the steppe a military advantage over those further away who have no access to horses, but obvious conflicts of interest prevent this from being a reliable method of equipping cavalry to fight the nomads themselves. “Divide and conquer” is the most effective response to the nomad threat, and many Chinese walls were built far out in nomad territory, serving to divide the nomads into friendly and unfriendly (or free and subject) groups. However, even the friendly groups could not be trusted; any army capable of fighting the nomads on even terms is effectively a nomad army itself, and has the same advantages against the people it defends as the hostile nomads do. (The Wiki map will have to do. The blue and bluish areas, including Tuva, are the Mongol homeland, divided according to tribe. The “Uyghurs” were located in Xinjiang and were only semi-independent; during Genghis Khan’s rise they were subject to the “Kara-kitai”, but they switched to the Mongols very early). All of the nomads’ military advantages were already there as early as 700 B.C., however, but for more than a thousand years the Cimmerians, Scythians, Sarmatians, Alans, Xiongnu, Huns, and so on limited themselves to trading, raiding, and the extortion of tribute, and with few exceptions never conquered and ruled an urbanized, literate society. Very gradually and haltingly, however, over a period of centuries, some nomad groups learned how to hold territory and rule cities. To a greater or lesser degree these new rulers sedentarized and adopted the culture of their subjects, but at the climax of the learning curve dual nomadic / sedentary states were developed whose equestrian ruling class kept to its steppe ways while becoming wealthy from taxes collected from the agricultural subject class. The Scythians north of the Black Sea during the classical era were the first to do this, and far from being a nation without agriculture, they were major grain exporters. During all periods, nomad peoples raised some grain. Agriculture is far from impossible on the steppe and some of the world’s best wheatland today is on former nomad territory in the Ukraine. When nomads do not grow grain, it is partly because of the difficulties involved in protecting their farmers and stores of grain from their own nomad enemies, and partly simply because comparative advantage mandates that they specialize in military affairs and buy grain with the proceeds. Scythian society was not urban, and the first literate, urban society to be ruled by nomads was the Kushan Empire in Afghanistan and neighboring areas. At approximately the beginning of the Christian era this area, formerly Bactrian Greece, was conquered by nomads from the north — Iranian-speaking Sakas, Tokharians, or both. The Kushans played a key role in the early Silk Road trade and a major role in the development and propagation of Mahayana Buddhism, but they left no written records — even their dates are guesswork — and they are the least known of the great civilizations. Over the centuries the Kushans were followed by the Hephthalites in the same area, various small states in northern China and in Xinjiang, the Toba Wei (Northern Wei) in much of northern China, the Turk empires (which briefly controlled the route from China to the Crimea), and the Bulgar and Khazar trade city-states (vestiges of the Turk empire) on the Volga and the Black Sea. Starting about 700 A.D., a number of mostly-Persian states in central Asia and the Middle East were taken over by usurping Turkish mercenaries, and the resulting states combined Persian urban life, agriculture, and political institutions with a Turkish military. Thus, when Genghis Khan came along the Middle East was already partially steppified. Looking at the big overall picture, in fact, by 1200 an enormous part of Eurasia was ruled by Turks, Arabs, Germans, Norse, or Hungarians — peoples who had been regarded as barbarians a thousand years earlier. In northern and northwestern China after about 900 AD, durable nomadic-sedentary hybrid states were formed which combined the military and other strengths of both sorts of society in a way that the earlier hybrid states hadn’t. First the Khitans, a steppe people related to the Mongols, conquered much of North China, and some of them mastered Chinese culture while others retained their steppe identity. Their state (called the Liao dynasty by the Chinese) was dual, with an version of Chinese law governing the Chinese parts of the realm and Kitan customary law governing the steppe areas. The dominant Khitans ruled from five capitals evenly spaced about their territories like an occupation army. Their military combined the speed and mobility of nomad armies with the logistic advantages and knowledge of siege warfare of the Chinese army. (Earlier nomads had not been able to conquer cities, partly because of their lack of siege engines and partly because they would run out of supplies before the cities surrendered). The innovative Khitan military helped the Liao state, despite its small size, hold its own (and more) against the much larger and wealthier Song state to the south. In 1038 the Tangut (of uncertain ethnicity, but not Chinese) established a different hybrid state (called the Xixia by the Chinese) in what is now Ningxia and Gansu in northwestern China, andthen in 1115 the Khitan were overthrown by the Jurchen, a mostly-agricultural Manchurian people from the far northeast of present-day China. The new Jurchen Jin dynasty adopted the hybrid institutional model established by the Khitan, taking both Chinese and Khitans into their service and expanding their empire southward at the expense of the Song Dynasty. However, some Khitans refused to accept Jurchen rule and fled to the steppe, and in 1124, seeing that the reconquest of northern China was impossible, they established a new hybrid Qarakitai state near Issyk-qul in present-day Kyrgyzstan. The Qarikitai ruled the neighboring steppe peoples, and with their help they became the hegemon of fragmented Western Turkestan to their south (essentially Uzbekistan and the other Turkish republics of Central Asia). In western Turkestan itself the dominant power was the weathy Khwarizmian Empire, which controlled the valuable trade routes between China to the east and India, the Middle East, Russia and the Mediterranean to the west. Khwarizm was also a hybrid regime but of a different and weaker sort. In the story of the Mongol conquests, the Khwarizmian Shah appears as a pitiful, cowardly figure who lost every battle he did not run from, but before the arrival of the Mongols showed up he was the strongest power in the Middle East, absorbing Afghanistan at one point, establishing a foothold even on the Arabian peninsula (according to Bregel’s atlas), and threatening Baghdad. Probably his army was as good as any, but his state was like a paper bag full of rocks and was continually falling apart even in peacetime. It was basically a collection of semi-autonomous walled cities bound by nothing more than promises, wishful thinking, and kinship, and when you find out that one Khwarizmian Shah had to fight and defeat his own mother’s army, driving her into miserable exile and death, you realize how weak those bonds were. By 1124 China north of the Huai River and China’s Silk Road link to places further west (Gansu and Xinjiang) were controlled by three different Sino-nomadic regimes, while the steppes to the north dominated by the Mongols (who, because of their disunity, were not yet a threat). The Central Asian hub from which trade routes led to India, the Middle East, and Europe was directly controlled by the Khwarizamshah, but from their strategic location to the northeast the Sino-Mongol Qaraqitai were masters of Khwarizm, something which was possible because the smaller Qaraqitai state intervened on behalf of the Khwarizmshah whenever his empire seemed to be about to disintegrate. The Qaraqitai also formed a barrier between Central Asia and the militarily fearsome Sino-Mongol world, but in 1211 defeated Naiman Mongols fleeing Genghis Khan collaborated with the Khwarizmians to usurp the Qaraqitai throne, and by 1220 the weakened Qaraqitai state had fallen to the Mongols. The barrier had been broken, from this point onward nothing could stand against the invaders from the east. * One part of the hybridization theory is speculative. One Mongol told a Song ambassador that during his youth Genghis Khan had been captured by the Jin and had spent time in the service of the Jin. Ratchnevsky thinks that this period was suppressed by the Mongol sources, and that this gap accounts for some of the chronological difficulties faced by those who try to reconstruct Genghis Khan’s early career. If the future khan had spent time with the Jin, this would have given him knowledge of Jin weaponry, tactics, and military organization, and he might also have become aware of higher level strategic and organizational principles. But this hypothesis is not necessary; during every era, captives, renegades and deserters from each side of the line were serving in the forces of the other side. My hypothesis is that during the last several decades of the twelfth century, the area of northern and western China, Manchuria, and Mongolia served as a pressure cooker or laboratory where strategy, tactics, and military organization were perfected during a period of constant warfare. The Jin Chinese fought against the Song Chinese and sometimes against the Xixia or the Mongols, the Xixia fought against the Jin and the Mongols, the Mongols fought against the other two and among themselves, and because these eastern peoples were busy fighting one another, they put little pressure on the Qarakitai farther west, who were thus able to concentrate on maintaining their hegemony in Western Turkestan. During these decades of practice wars, the states in this zone (and the non-state Mongols) hardened up, improving their discipline, organization and skills , so that when Genghis Khan finally united the steppe, subjugated the Xixia, neutralized the Jin, and absorbed substantial parts of the Jin armies, he had essentially won the military championship of the toughest league in the world, and every army he met from that time until he fought the Mamluks in Egypt would be far inferior to his. Furthermore, once he controlled a plurality of the steppe, there was a snowball effect as most of the remaining steppe peoples semi-voluntarily joined him (the alternative being destruction). Events support this conclusion: defeated armies fleeing thishigh-pressure zone were formidable when they reached the west. The founders of the Qarakitai state, a defeated remnant of the Qitan forces, were able to establish themselves in Kyrgyzstan, becoming the dominant power in Central Asia. When the defeated Naiman fled to the Qarakitai, they immediately became major players in the area and eventually usurped the Karakitai throne. Finally, when the Mongols destroyed the Khwarizmian army in 1220, the survivors fled to the Middle East, where they established a reputation for ferocity and in 1244 conquered Jerusalem for Islam. A contemporary version of this hypothesis is reported by the Persian historian Juvaini. When the Naiman and the Khwarizmians together finally destroyed the Karakitai, most Khwarizmians rejoiced, but Juvaini reports (p. 347) that one wise man did not rejoice, because he realized that the Karakitai were a buffer protecting them from the Mongols. The wise man said, “Beyond these Turks are a people stubborn in their vengeance and fury and exceeding Gog and Magog in the multitude of their numbers. And the people of Khitai were in truth the wall of Zul-Qarnain [Alexander the Great] between us and them. And it is unlikely, when that wall is gone, that there will be any peace within this realm or that any man will recline in comfort and enjoyment. Today I am mourning for Islam.” It is also reported that some time before the final Mongol attack the Shah had chanced to see a Mongol army in action and had been terrified by what he saw, so that he was ready to surrender almost before the Mongol attack had even begun — though all this might just be a historian’s fiction, in the time-honored tradition requires that the defeated be described as decadent and cowardly. Overconfidence on the part of the Jurchen Jin probably also contributed to the Mongol triumph. Like the Khwarizmians, the Jin Chinese are portrayed in history history as pathetic losers, but they were fearsome soldiers and their overconfidence came from this. Their first mistake was to underestimate the Mongol threat and continue their invasions of Song territory even when they were under Mongol attack in the North. The Song later made the same mistake when they allied themselves with the Mongols to weaken the Jin. Against these states and the Xixia the Mongols played the same “divide and conquer” game that the Chinese had so often played so against the various steppe peoples, subduing first the Xixia, next the Jin, and finally the Song. The second Jin mistake was to alienate the allied peoples buffering them from the Mongols and their own troops. During every era the Chinese have used treaties, diplomacy, and tribute to gain the support of a few steppe and border peoples to use against the rest, but toward the end of the twelfth century the Jin adopted an unnecessarily harsh policy against their steppe allies. In 1196, because of a dispute over plunder, the Jin came into conflict with the Tatars, who had been in the Jin service for decades. Genghis Khan and his then-overlord Ong Qan aided the Jin in this fight, and for this they were awarded Chinese titles. Jin harshness toward its allies continued, and when Genghis Khan united the nomads and attacked the Jin themselves about fifteen years later, many of the Jin’s allies and many non-Jurchen contingents in the Jin army went ove to the Mongols. Genghis Khan himself has to be one of the reasons for the Mongol success. When he unified the steppe by recruiting supporters and annihilating rivals, he was not gaining control of an existing political organization, but bringing a new one into being. (In this he resembles some of the classical founders described by Plutarch, and as far as that goes, Moses in the Old Testament). Steppe societies alternated between periods of unity and periods of fragmentation and constant feuding. Unity was normally achieved in response to a military threat or a military opportunity, and the required submission of all to a “Great Khan”. Each Great Khan give his own stamp to the horde he created, and in the case of Genghis Khan this process of creation has been documented in considerable detail. Eight books in Persian, Chinese, and Mongol give us significant information about Genghis Khan’s career, and we actually know much more about him than we do about Alexander or Charlemagne. These sources are good ones and require only the same kinds of correction and and analysis that any primary source requires. The main Mongol source on the life of Genghis Khan, Secret History of the Mongols is sometimes thought to be legendary. mythical, or poetic, but this is true only of about a tenth of of the book. In all these sources Genghis Khan is not portrayed as a hero or as a bold warrior, but mostly as a charismatic leader of men, a great organizer, and a clever strategist. The Secret History describes Genghis Khan’s political / military career and includes what amounts to an institutional history of Genghis Khan’s three-step organization of the Mongol army / state. The Mongol horde was a centralized, rationalized, military-political organization obedient to Genghis Khan’s command. (Civilian Mongols were, in effect, a support group for the army). As he consolidated his power, he destroyed hostile tribal groups by killing their leadership and dispersing their common soldiers into military groups organized as a chain of command and obedient to him. Loyal tribal groups and their leaders were not harmed, but steps were taken to keep these tribes from becoming power centers which might become oppositional: Genghis Khan essentially detribalized the Mongols. As such founders do everywhere, he also established an elite corps loyal only to him. This guard corps was drawn from every part of the army and from various different tribes, and each member in it had precedence over any other member of the army, regardless of rank. Genghis Khan was also a tactical and strategic genius, but I’m running out of time. Suffice it to say that the popular image of the Mongol hordes as a swarm of raging savages is diametrically opposed to the reality — the Mongol Army was perhaps more disciplined and efficient than any other army before or since, and its organization of the various specialized functions of warfare and diplomacy was methodical and perfectionist. To sum up: the Mongols started out with the same advantages that nomad cavalry armies had always had over sedentary armies defending fixed lines and vulnerable real property. Over the course of centuries hybrid nomad-sedentary states developed whose armies combined the strengths of sedentary and nomad armies. This process culminated during the period 900-1200 AD in the north and northwest of China, where for a century or more armies of this type contended with one another and with the still-nomadic Mongols. At the beginning of the thirteenth century Genghis Khan unified the Mongols and formed them into a disciplined military / political unit. Gradually this unified nomad force gained dominance over the hybrid states confronting it, and upon doing so absorbed many of their military specialists and other military units. The century of warfare had served as a military training-ground, and when the resulting force finally broke out of the intercivilizational area where it had been formed, it was unstoppable and swept everything before it. The attempt to find a single cause (much less a pattern) in this way is really implausible, since the circumstances of the different invasions were many and various and the invasions themselves were not nrcessarily very similar to one another. A common but erroneous assumption is that these wars were unusual and in need of explanation, and that without some cause, the nomads would have stayed quietly and peacefully in their homeland forever. But this is not true; the steppe-sedentary divide has been an area of constant conflict at least since the first nomad army was formed toward the beginning of the first millennium B.C. For the steppe peoples, predatory warfare was legitimate and normal, and war was the most honorable of all human activities — and much the same was true of many other peoples before and since, e.g. the medieval European nobility, or the various European nations starting about 1500 AD. One common dynamic for invasions, however, can be related to population growth: some societies raise more strong, aggressive young men than they need or have resources and statuses for, and (rather than having them hanging around making trouble) these extra men are sent off into a kind of exile, during which they raid and invade their neighbors (or more distant peoples) and, if possible, occupy new territory. This dynamic can probably be seen in every expansionist society — Hellenes, Vikings, Turks, Cossacks. (In “Youth in aristocratic society” Duby describes such a case in Europe at the time of the Crusades). The problem with the “overpopulation” thesis is that it treats a resource (a group of capable young warriors) as a problem or deficiency, and the wars that this manpower pool makes possible are treated as solutions to problems rather than as opportunities for accomplishment. There are two main motives for the popularity of “causal” explanations (as opposed to voluntary “motive” explanations). First, many historians want to be scientists, or at least they did in the past, and according to pop philosophy of science, materialist reduction, causal explanation, and the discovery of regular cycles are what scientists do. And second, the strangeness of the nomads and their sudden brutal impact on the societies they attacked has made it tempting to dehumanize them and treat their invasions as blind destructive forces like hurricanes, earthquakes or volcanic eruptions. 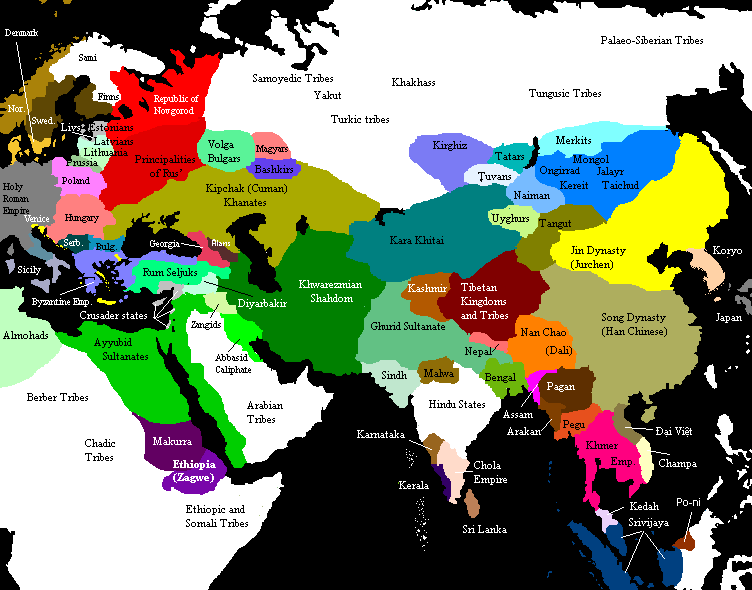 Besides the military-political learning curve by which the nomads learned to conquer and rule sedentary peoples, there was the geographical learning curve: learning to think of the whole of Eurasia as a single unit. During the earliest period (before about 200 BC) China was isolated from the rest of urbanized Eurasia, with small amounts of trade being carried on by anonymous, low status intermediaries. To a lesser degree, Europe, the Middle East, and India were also strange to one another. Around 200 BC China reached western Turkestan, and through them was in indirect communication with the Middle East, India, and the Black Sea. But while there was a considerable volume of transcontinental trade on the Silk Roads and via the Indian Ocean*, it was always through intermediaries, and while travel from China to Central Asia was fairly common, there are only a few doubtful reports of any individual travelling from China to Greece, Rome, or the Middle East, or of Greeks or Romans travelling to Central Asia or China. As a result, the civilized picture of the Eurasian continent was patchy and discontinuous “Here be monsters“. This only started to change when during the sixth century the Turks founded an Inner Eurasian empire reaching from the borders of China almost to the Black Sea. This empire was fragile and divided and never securely held, but a Turkish embassy did reach Constantinople in 568 AD, and this it was the first time on record that anyone who had ever seen China also saw Europe. Coedes has gathered all classical Greek and Latin references to China before the time of Marco Polo, and before the very brief report received from this Turkish embassy, none of them were more than rumors and cliches, mostly about silk, with a fair proportion of them flatly wrong. It is my conjecture that the concept of Eurasia, the idea of a route from China to the Mediterranean, and even the idea of a single ruler bringing the whole continent the whole continent to order were born among the Turks at this time, to be kept alive for centuries in legend and in imaginary projection, ultimately to be attained by the Mongols. The disintegrating Turk Empire left two trade cities behind on the Volga: Atil (Khazaria) and Bulgar, and these served as a reminder of what might be possible. Not too long afterwards the Varangians or Rus established a trade network which ultimately spread from Scandinavia to the Caspian Sea and to Greenland, and for more and more people (even in the sedentary world) Inner Asia came to be an imaginable actuality rather than a place of monsters. But after the collapse of the earlier and later Turk empires the steppe again became fragmented and unstable, and it would be almost 700 years before the Mongol Empire would make it again possible to travel routinely from Constantinople to China: and as we know, the European vision of a knowable and explorable world came from Marco Polo’s reports on that route. Appendix Three: Why Not The Mongols? The end of the Mongol expansion, and the division and fall of the Mongol Empire, have drawn the same kinds of speculation as its rise. It is alleged that the empire fell apart and didn’t last long because of the Mongols were nomads incapable of governing, but this is not true. The united empire founded by Genghis Khan may not even have lasted until his death in 1228, and after a period of doubtful unity the empire was definitively divided in 1262 when the Golden Horde in Russia went to war with the Ilkhans in the Middle East. However, this kind of things is normal for conquest empires, and much the same happened with Charlemagne’s and Alexander’s empires. Of the three large Mongol empires coming out of this breakup, the Ilkhanid empire in the Middle East matched up pretty well with the earlier empires in that area, whereas those in China and Russia both united a territory larger than that of any predecessor. These three empires lasted respectively 97, 79, and 279 years, and while the first two were relatively short-lived, they both cover several generations and are nothing like the fly-by-night kingdoms founded, for example, during Chinese periods of disunity. Far from being incapable of governing, the Mongols were political specialists, and many of their institutions were continued by their successors. The limits of Mongol progress have also drawn speculation. The Mongols’ farthest attempts were at Leignitz / Legnica (Poland) and Budapest in 1241; Ayn Jalut in southern Palestine in 1260; Japan in 1274 and 1281; Burma in 1277-1283; Vietnam 1257-1288; Java in 1293; and India at various times. None of these nations was ever incorporated into the Mongol Empire, though Hungary was devastated and tribute relations were established in several cases. The western halting points have received more attention. It is sometimes said that the Mongols failed to conquer Europe and Egypt because of a lack of pasture, but the Mongols were adaptable and conquered Song China using methods completely different than their traditional cavalry warfare. It is sometimes claimed that the Mongols were defeated at Leignitz, but that particular Mongol force was a diversionary force which, when its job was done, withdrew to join the main force near Budapest to help crush the Hungarians at Mohi. The Mongol army defeated at Ajn Jalut was likewise not a major expeditionary force, since the Persian Mongol leaders had returned to Mongolia in 1260 to elect Kubilai Khan (just as the earlier Mongols had returned to Mongolia to elect Guyuk in 1241) . In view of the Mongols’ defeat of the Hungarians and their allies, it seems that they could have continued into western Europe when they returned to battle after the election of Guyuk, but the Mongol Empire was already falling apart. Soon enough the Russian Mongols (allied with the Mamluks in Egypt) were fighting the Persian Mongols, and whatever plans there had been to advance into Europe were forgotten. The short answer seems to be that the Mongols were defeated by the tropics and the sea in the east, and by their own disunity in the west. Abu-Ligoud, Janet, Before European Hegemony, Oxford, 1991. Barfield, Thomas, The Perilous Frontier, Wiley-Blackwell, 1992. Black-Michaud, Jacob, Cohesive Force, Blackwell, 1975. Bregel, Yuri, An Historical Atlas of Central Asia, 2003, Brill. Buell, Paul D, “The Role of the Sino-Mongolian Frontier Zone in the Rise of Chinggis-Qan”, pp. 63-76, Studies on Mongolia, ed. Schwarz, Bellingham, 1979. Coedes, Georges, Testimonia of Greek and Latin Writers on the Lands and Peoples of the Far East, Ares, 1979.
de Rachewiltz, Igor, The Secret History of the Mongols, Brill, 2006.
di Cosmo, Nicola, Ancient China and its Enemies, Cambridge, 2004. Duby, Georges, “Youth in Aristocratic Society’, in The Chivalrous Society, California, 1977, pp. 112-122. Fletcher, Joseph F., Studies in Chinese and Islamic Inner Asia, Variorum, 1995. France, John, Western Warfare in the Age of the Crusades, Cornell, 1999. Fried, Morton, The Evolution of Political Society, McGraw-Hill, 1967. Hambis, L., Gengis-khan, Paris, 1973. Juvaini, Ata-malik (tr. Boyle), Genghis Khan, U. of Washington, 1997. Khazanov, A. P., Nomads and the Outside World, Wisconsin, 1994. Lane, Frederick, Venice and History, Johns Hopkins, 1966. Lattimore, Owen, Studies in Frontier History, Oxford, 1962 (especially “The Geographical Factor in Mongol History”), pp. 241-258. Lattimore, Owen, Inner Asian Frontiers of China, 1962, Beacon: pp, 238-251, “The ‘Reservoir’ and the Marginal Zone”. Leach, Edmund, Political Systems of Highland Burma, Beacon, 1954. Lewis, Mark Edward, Sanctioned Violence in Early China, SUNY, 2007. Lindner, Rudi Paul, “What was a Nomadic Tribe?”, Comparative Studies in Society and History, 1982. Martin, Henry Desmond, The Rise of Chingis Khan His Conquest of North China, Octagon, 1971. May, Timothy, The Mongol Art of War, Westholme, 2007. Olbrecht, P. and Pinks, E., trs. , Meng-Ta Pei-lu Und Hei-ta Shih-lueh, Wiesbaden, 1980. Pelliot, Paul, and Hambis, L., Histoire des Campagnes de Gengis Khan, Leiden, 1951. Rashid ad-din, tr. Thackston, Wheeler, A Compendium of Chronicles, Harvard, 1998-1999. Ratchnevsky, Paul, Genghis Khan, Blackwell, 1991. Reid, Robert R., A Brief Political and Military Chronology of the Mediaeval Mongols, Mongolia Society, 2002. Steensgaard, Niels, “Violence and the Rise of Capitalism”, Review of the Braudel Center, V:2, Fall 1981, pp. 247-73. Teggart, F.A., Rome and China, Greenwood, 1983. Togan, Isenbike, Flexibility and Limitation in Steppe Formations, Brill, 1998. Waldron, Arthur, The Great Wall of China, Cambridge, 1990. Wang Kuo-wei, Meng-ku Shih-liao Ssu-chung, Peking, 1934. I’m very intrigued by the bit about “Cathay” and “China” being conceived separately at some times. Can you provide a source so I can read more? Thanks. Minivet: it’s sort of a truism and I can’t remember the source. “Cathay” has to be from after 900 AD and by the land route, and it may only be from Polo’s time (ca. 1300). Some version of “China” or “Sina” goes back to the Roman Empire, and the Indian Ocean trade used that name (though it was in Muslim hands 700-1400 BC.) 900-1280 AD they actually were two different states, both Chinese in culture. Some of us have not forgotten and maintain a watch even now. Would that exception be the Huns in the 5th C.? Priskos’ report might suggest as much. No, I was thinking of the Kushans in Asia. There’s so little record of them any more that I hedged, probably more than I should have. The Scythians during the classical era were grain exporters, as reported by Herodotus and confirmed by archaeology. They were divided into two groups, of whom the rulers were the nomad warriors. They were increasingly a settled people (a little like the Huns you mention) but neither developed cities of their own nor conquered any urban people. In the Eastern Europe contact zone some Goths, an agricultural people, became nomadized and some peoples from the east became sedentary. This was a function of geography and military organization. Descendants of nomads still survive in Poland, Lithuania, and Belarus (the Lipka Tatars, of whom Charles Bronson was one), and the Hungarians went through a nomad phase. So the Huns were in an initial phase of sedentarization, but hadn’t moved very far down that road. A Google Books search on “Cathay” will prove fruitful. Especially interesting is the estimable Hakluyt Society’s “Cathay and the Way Thither: Being a Collection of Medieval Notices of China”. There’s room for an update on Pelliot and Yule by now, but who could do it? Pelliot researched in about 15 languages. Finally, after the Mongols destroyed the Khwarizmian army in Uzbekistan in 1220, the survivors fled to the Middle East, where they established a reputation for ferocity and, in 1224, conquered Jerusalem for Islam. Probably twenty years later, when they pretty much destroyed Jerusalem. The Ayyubids held it until ceding it to Frederick II of the fifth Crusade in 1228 or thereabouts. Jonathon Spence mentions in his The Memory Palaces of Matteo Ricci, that Ricci wrote to friends or collegues in Italy from China that he had discovered that Cathay and China referred to the same country, a fact that had apparently been shrouded in ambiguity. This circa 1595 or so. I have corrected the date to 1244. I can only assume that I mistyped at some point along the way. The true story is much more plausible, though less dramatic. John M Smith makes a strong case (in a famous paper I can’t find) that the Mongols were defeated at Ayn Jalut in large part because they had left good grazing lands; typically they traveled with 3-5 horses apiece which required strong supply lines that were no longer tenable as they moved south. Anyway you’ve done a nice succinct summary that I’ve enjoyed reading. Thanks. That was true of that battle. If the Mongols, securely established in the Middle East, hadn’t had to contend with the Golden Horde Mongols in their rear (who were actively helping the Mamluks), they could have organized an attack less dependent on cavalry, as they did successfully in South China and less successfully in Japan and Java. The Ayn Jalut battle was not a full scale attack with the entire weight of the Mongol Empire, or even the Ilkhanate, behind it. When you think about it, the Mongol Empire is a rare and probably unique case of non-delusional megalomania. Barbarians with horses had conquered empires long before cavalry; they used chariots. You’ve left out the Mitanni, the Hittites, the Medes and the Persians, the Aryan invaders of northern South Asia. They weren’t nomads, though, and their armies weren’t cavalry armies. My topic is specifically the ~700 BC — ~1300 AD history of nomad cavalry invasions. Drews’ The End of the Bronze Age talks about the end of the chariot era in W. Eurasia about 1000 BC or before, and in Creel’s “What is Taoism?” hthe author talks about the relative useless o the chariot in China after about 800BC.